How do you sneak past a barrier? Perhaps you hitch a ride with someone who’s allowed across. That’s one strategy scientists are considering to deliver biological therapeutics for nervous disorders such as ALS across the endothelial cells tightly lining the blood-brain barrier. 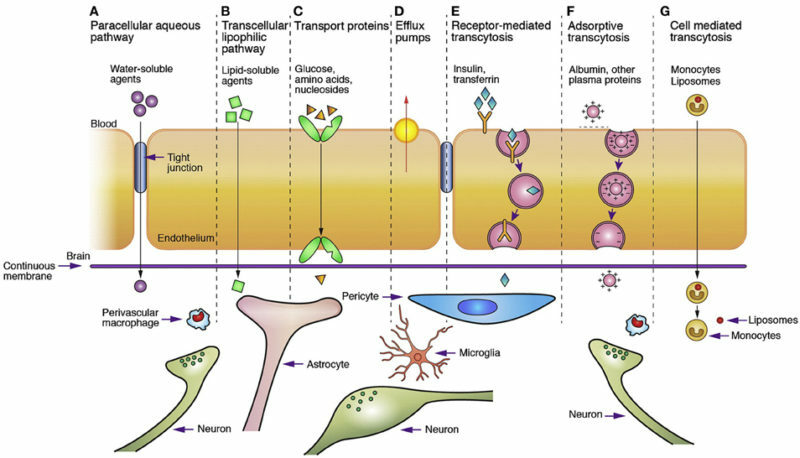 Exosomes, extracellular vesicles just 30-150 nanometers across, are increasingly recognized as an important player in the CNS, where they mediate communication between neurons and glia. They protect neurons and may even help axons regenerate (Lopez-Verrilli et al., 2013; Goncalves et al., 2015; Hervera et al., 2018). He and others are looking into ways to deliver therapies, such as mRNAs or enzymes, as exosome cargo into the brain to treat neurodegenerative disease. “I believe exosomes are an exciting therapeutic modality that should see clinical deployment in the next few years,” said HaiFang Yin of Tianjin Medical University in China. Oxford start-up Evox Therapeutics in England is banking on exosomes to treat rare neurological and neuromuscular diseases too. “However, there are a number of hurdles that need to be overcome,” said Yin. For treatments to be feasible, drug makers need reliable ways to load the cargo into exosomes at clinically meaningful dosages and deliver them to the right place. These vesicles will also need to be highly purified, clinical grade, and safe. Scientists are beginning to overcome some of these obstacles. In April, Fussenegger’s team reported an approach to produce and deliver large numbers of exosomes to the CNS (Kojima et al., 2018). And in June, Yin’s group introduced a method to capture, load and target exosomes to specific tissues, focusing on muscle (Gao et al., 2018). Therapies using these strategies are already beginning to show signs of benefit in models of neurodegenerative and neuromuscular disease. Matthew Wood and colleagues at the University of Oxford in England were among the first to perform key tests to determine whether exosomes could deliver RNA-targeted therapies to the brain. 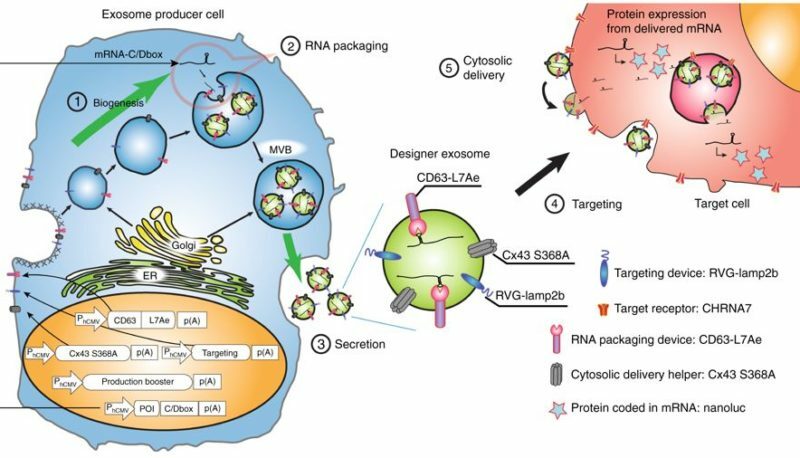 It was already known that these extracellular vesicles do carry RNAs, including mRNAs and microRNAs, and can transport them to cells in vitro (Valadi et al., 2007). The researchers decorated the exosome surfaces with neuron-specific peptides. Then, they electroporated the vesicles to load them with short interfering RNAs. One concern was that the immune system could react to exosomes from a foreign source, and attack them. For that reason, the researchers used dendritic cells from the same mouse line to generate them. They chose dendritic cells because these lack key immune activators. With this protocol, they could knock down an Alzheimer’s disease target, BACE1, in the brain by 62% (Alvarez-Erviti et al., 2011). Fussenegger was also intrigued by the possibility of exosomes for treating neurodegenerative disease. His group started by using existing protocols to generate them. 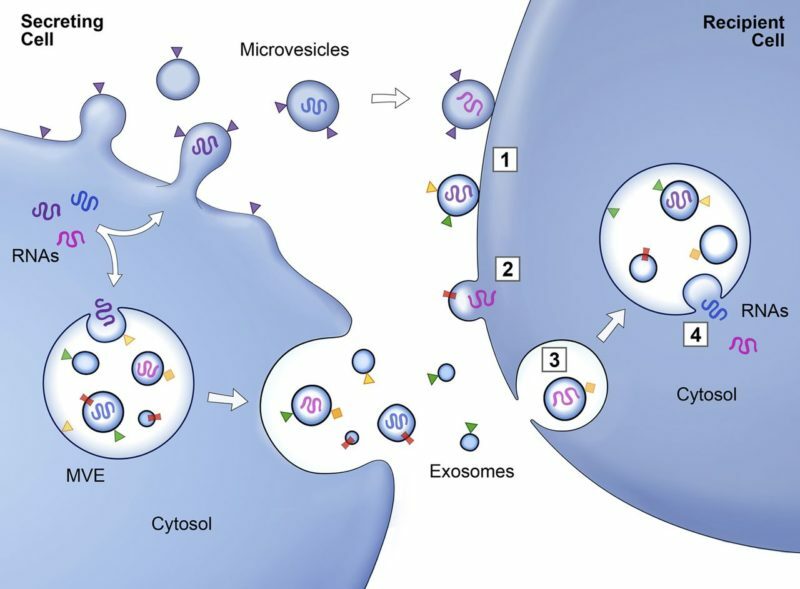 “We realized very soon that we’re not able to produce enough exosomes,” Fussenegger recalled. They’d like to design cells that, when implanted into people, would release plenty of exosomes loaded with RNA treatments, such as mRNAs encoding therapeutic proteins. That’s why they created EXOsomal Transfer Into Cells, or EXOtics. These intracellular, genetic devices boost the number of drug-packed exosomes released and their delivery to the cytosol of target cells. For example, the “Production Booster” increased exosome secretion 15- to 40-fold. The researchers tested this approach in a mouse model of Parkinson’s disease. They injected a toxin, 6-OHDA, into the brain, which induced production of reactive oxygen species and neuronal damage. Then, they used implants expressing these genetic devices, under the skin, to deliver a therapeutic catalase mRNA. The approach significantly reduced neuroinflammation. Moreover, there was less cell death surrounding the toxin injection site of treated animals. The researchers also tested exosomes displaying the neuron-specific peptide RVG, but it didn’t enhance brain targeting in their hands. However, their system seemed to produce enough exosomes that a sufficient quantity reached the brain. Theoretically, the system could deliver other kinds of cargoes, too, such as antisense oligonucleotides and short interfering RNAs. Now, Fussenegger’s team is testing their approach in cell lines compatible with human therapeutic use and in larger animals, in the hopes of reaching clinical trials within five years. “They have done a fantastic job at developing a methodology to modify exosome-producing cells to achieve higher production, targeting and cargo-loading,” said Yin. 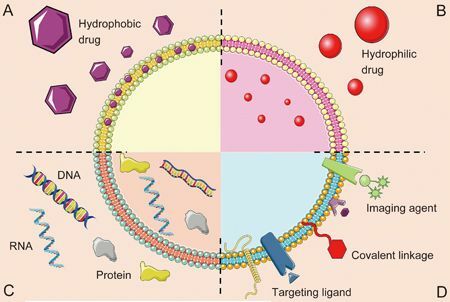 This approach, however, would require engineering cell lines to produce each drug delivery vehicle. Not all cell types can be easily transfected, says Yin. Instead, he envisions purifying a person’s own exosomes, loading them with a therapy, then re-infusing them. That’s why Tianjin Medical University staff scientist Xianjun Gao developed a method to load exosomes from the outside. He identified a peptide, CD05, that specifically binds a protein called CD63 on the exosome surface. So, he could use this peptide to collect exosomes from human serum, or to attach a biomolecule to them. With CD63 so abundant on exosome surfaces, the researchers could even use CD05 to load two biomolecules onto these vesicles. That way, they could attach one therapeutic molecule and one peptide to target the right tissues. The group tested this idea in a model of Duchenne muscular dystrophy, a muscle disease resulting from dystrophin deficiency. These mdx mice harbor a mutation in exon 23 of the dystrophin gene, which results in a foreshortened protein. For the therapeutic, the authors attached CP05 to an antisense oligonucleotide known to promote skipping of exon 23, and thus production of a near-full-length protein (Fletcher et al., 2007). To target the muscles that needed the treatment, they also hooked CP05 to a targeting peptide, M12. They incubated exosomes with both constructs, then injected them into the mice. Dystrophin levels rose in multiple muscles, and paw grip strength improved. Yin isn’t sure how the cargo gets from the outside of the exosome to the interior of the target muscle cells. Presumably, his system could deliver any molecule he can link to CP05, to any tissue, including the central nervous system. In fact, painting exosomes with the neuron-targeting RVG peptide tripled delivery of injected exosomes to the mouse brain. “This is very smart,” commented Fussenegger. The two approaches are complementary, suggested Yin, and could be selected by drugmakers depending on their needs. 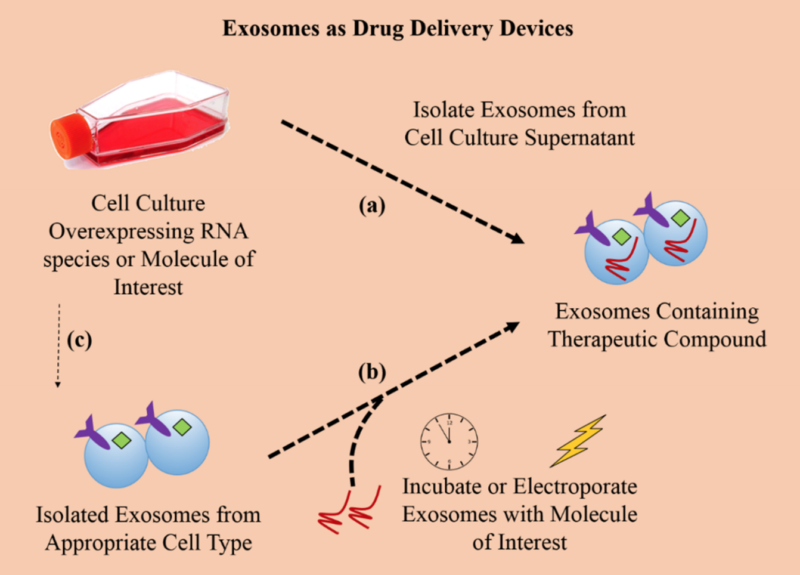 Fussenegger’s approach would provide long-term delivery of exosomes, made in the body. But, it would require cell transplantation and genetic engineering of people’s own cells. Yin’s avoids the need for these procedures, but would require isolation and loading of exosomes for every dose. Evox CEO Tony de Fougerolles called Yin’s drug delivery strategy an “interesting approach” but was concerned about how tightly a therapy might bind to CD63, via CP05. The amount attached to the exosome surface might vary between batches, making it difficult to control drug dosing he said. In fact, Yin said, his group is now looking for peptides with higher affinity, to address this issue. They’re also taking steps to commercialize the approach. Evox, meanwhile, expects to have its first drug in human trials within a couple of years. Their strategy: use a standard cell line to produce exosomes loaded with the drug of choice, then isolate the exosomes for injection. (Codiak BioSciences in Cambridge, Massachusetts, is using a similar approach to develop therapies for diseases including pancreatic cancer (Kamerkar et al., 2017). Thus far, in animal models, Evox can get 3-4 percent of therapeutics across the blood-brain barrier, compared to just 0.1 percent for biological treatments without exosomes, de Fougerolles said. Compared to implanting exosome-producing cells, as Fussenegger envisions, de Fougerolles said this plan will give physicians more control over drug dosing. And, he added, the approach is unlikely to cause an immune reaction. After all, anyone who undergoes a blood transfusion receives trillions of donor exosomes, with apparently no ill effect, he said. However, it’s not known how long implanted exosomes will last. Injections once or twice weekly, or even less often, should be possible, de Fougerolles speculated. Of course, exosomes aren’t the only option. Many substances squeeze through the blood-brain barrier by transcytosis. In this process, receptors on endothelial cells import ligands circulating in the blood and expel them into the brain. By hooking the drug of choice—an antibody, say—to a ligand for one of these receptors, bioengineers can trick the endothelial cells into transporting the drug, too. They are also less likely, compared to large antibodies, to cause these brain entry receptors to cluster, which can lead to degradation of cargoes, he said. To cross the blood-brain barrier, Ossianix scientists attach the therapeutic molecule—a regular-sized antibody, perhaps, or an enzyme—to the variable domain of a shark antibody targeting a brain entry receptor such as the transferrin receptor or CD98. The shark sequences act as the key, binding the receptor and shuttling the whole complex across the barrier. The strategy is one of an number of approaches companies including Denali Therapeutics in San Francisco, California, and Roche in Basel, Switzerland, are developing to smuggle drugs into the CNS (Jan 2016 news; Jan 2014 news). With this approach, Ossianix can deliver about 5-10 percent of therapeutics they’ve tested thus far into the brain, Walsh said. Several neurodegenerative diseases, such as multiple sclerosis, are in Ossianix’s sights. The company is already collaborating with Lundbeck, a Copenhagen drugmaker developing therapies for Alzheimer’s and Parkinson’s. Walsh said that there are several possibilities to use its approach for ALS, particularly for C9orf72 cases. He hopes to start within two to three years. In the meantime, in Europe, scientists in pharma and academia are partnering to identify endothelial receptors that specifically decorate the blood-brain barrier. Armed with those receptors, they hope to deliver higher levels of drugs into the brain (Mäger et al., 2017). Going COMPACT. A large public-private partnership in Europe is mapping transport pathways through the blood-brain barrier in hopes to leverage them to deliver drugs to the CNS more efficiently. [Courtesy of Mager et al., 2017. Neuropharmacology. CC BY 4.0]. Whatever the approach, the key questions are the same, said Walsh: “At what dose can you achieve a therapeutic level, can you achieve that level consistently, and are there any side effects?” Scientists will have to answer each question as they continue trying to overcome the blood-brain barrier.